I'm liking Echobode thus far, great job guys! I've searched for MIDI Learn on the GUI and in the manual and can't find anything. 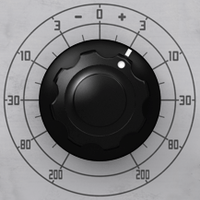 I would really like to control a few of the knobs with external CC controls. Is there a way to set that up? Am I missing something in the manual or on the GUI? Thanks Galbatron. I'm curious about Reaper and plan to check it out. For now, Sonar is definitely my DAW. Hello Magnus and Fredrik, can you advise? Is there a plan to add MIDI learn to a future rev of Echobode? MIDI-learn is on my to-do list. I built a high-level plug-in framework last year (on top of my lower-level framework :) ) that we now use for Bitspeek, Echobode and in part for Permut8. Adding MIDI mapping to this framework makes good sense now since it would then be available for all these products. Thank you Magnus, that's great news! I did not see your quote in the other thread, my apologies. Keep up the good work, enjoying both Echobode and Synplant here!! Hi, I was looking for a way to change presets, with midi or keys (anything but the mouse while needing to look at the screen). Do I understand well that this is the relevant topic, and that this is still not possible?